This lecture featured historian and author Andrew Roberts, author of the recent biography Churchill: Walking with Destiny, described by the Wall Street Journal as “unarguably the best single-volume biography of Churchill.” In recognition of Churchill’s love of Shakespeare, this lecture was held at Odessa’s Globe Theater. This lecture featured scholar Amy Myers Jaffe, public official Christi Craddick (Chairman of the Texas Railroad Commission), and investor and author Gary Sernovitz; the lecture was moderated by Jacki Pick, host of the Dallas based radio program the Jacki Daily Show. This lecture featured athlete, author, and educator Jackie Joyner-Kersee. This lecture featured author and radio host Eric Metaxas. Metaxas spoke on the interrelationship of faith, virtue, and freedom in history, including in the lives of Martin Luther, William Wilberforce, Dietrich Bonhoeffer, and in the creation of the United States. This lecture featured economists Steve Moore & Dr. Ray Perryman discussing the impact of the oil and gas industry on the economy. Moore primarily spoke about the national economy, while Perryman spoke about the local economy. This lecture featured Terry Crews, the action-movie hero, sitcom star, syndicated game show host, Old Spice pitchman, former NFL player, and best-selling author. Crews spoke to a crowd of over 1,400 about how humor has helped guide him and shape him into the leader he is today. Speaking to many young audience members, Crews spoke about the importance of creativity and hard work. 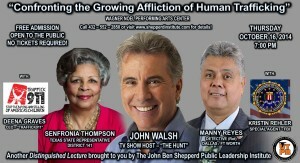 This lecture featured Alan Colmes, radio host, and Judge Jeanine Pirro, host of Justice with Judge Jeanine. During this lecture, our guests primarily discussed what the next president should and needs to accomplish in his first 100 days. Topics ranged from education to immigration and national security. 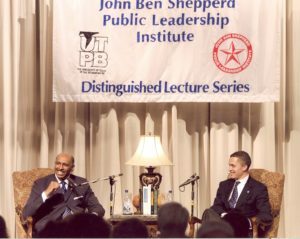 The lecture featured four panelists: Juan Williams (Fox News Contributor and Host of The Five, The Honorable Allen West (former U.S. Congressman and Executive Director of the National Center for Policy and Analysis), The Honorable Gilberto Hinojosa (Chairman, Texas Democratic Party), and Tom Mechler (Chairman, Texas Republican Party). The goal of the lecture was to discuss current issues and imperatives that drive us to vote in particular ways, along with political party platform positions and goals, and the proposed means to achieve them. This lecture featured Ben Vereen, the consummate actor, singer, and all around entertainer of our times. Vereen discussed his thoughts on the many proud contributions of African-Americans, current social movements and what we all can do to ensure maximum inclusion of every American. This lecture featured Former First Lady Laura Bush – One of America’s most popular First Ladies, Mrs. Laura W. Bush discussed her life and shared a compelling voice for helping those in need. She spoke passionately about education, literacy, volunteerism, human rights and the issues of global importance she championed in the White House. This lecture featured Geraldo Rivera – attorney, reporter, author & talk show host & Jackie Cruz – a Dominican–American actress, musician and former model, known for her role as Marisol “Flaca” Gonzales on the Netflix television series Orange Is the New Black. Geraldo and Jackie both delivered phenomenal lectures examining and celebrating the progress and achievements of Hispanic Americans in both Texas and the nation. The lecture featured Alex Sheen, founder of the non-profit organization “because I said I would,” who spoke about the power of promises to bind people together and motivate leaders to great accomplishments and to ethical behavior. By special arrangement with Ector County ISD, Alex also spoke to students at Ector Junior High and Bonham Middle School. The lecture featured former 2014 Texas Gubernatorial Democrat Nominee & Author Wendy Davis. The goal of the lecture was to examine the state of affairs in Texas public education systems today, particularly with regard to funding. We discussed positive movements in the charter school arena, and what we can do to marry traditional and charter public school interests so that they sustain and support each other’s efforts. The lecture featured former Governor and Vice Presidential candidate Sarah Palin, and host of the new television show “Amazing America” on The Sportsman Channel. The goal of the lecture was to examine and illuminate how women continue to exercise great leadership in action in our times. We discussed the general characteristics and demands of 21st century leadership, then talked about how women are meeting those challenges. 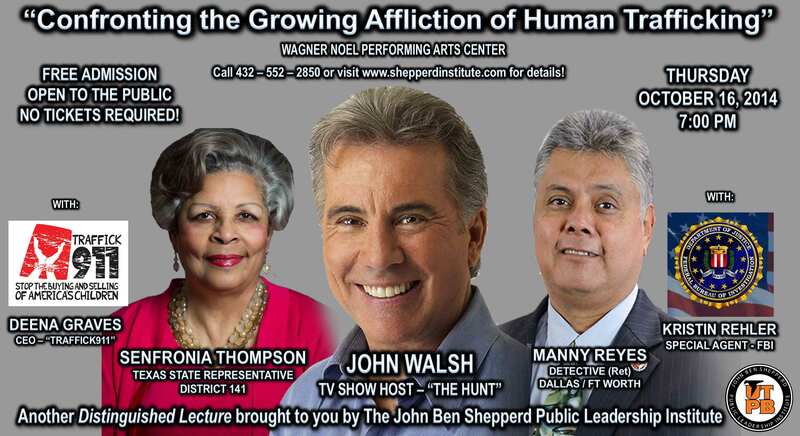 Speakers: John Walsh, Texas State Representative Senfronia Thompson, retired Fort Worth Detective Manny Reyes, FBI Special Agent Kristin Rehlin, and Traffick911 CEO Deena Graves. Moderated by Pat Canty & Dr. Robert Brescia. Speakers: Ben Stein, Ray Perryman, Richard Bowen. Moderated by Pat Canty & Dr. Robert Brescia. Speakers: John R. Lott, Jr. and Dr. Michael Shermer. Moderated by Pat Canty, publisher of the Odessa American. 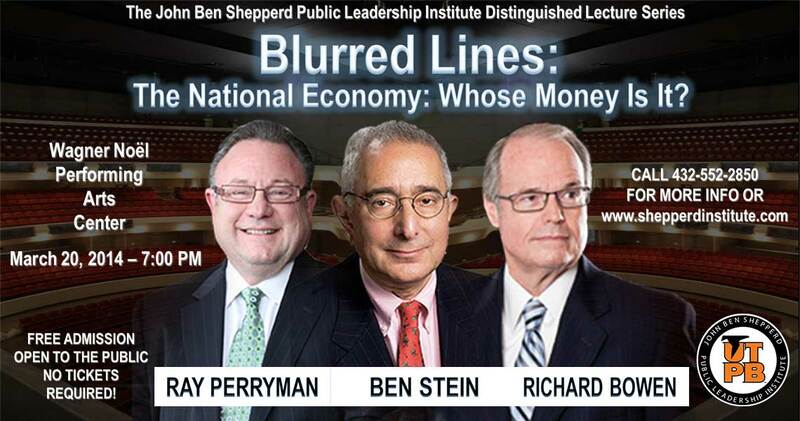 Speakers: David Frum, Jeff Greenfield, Moderated by Pat Canty, publisher of the Odessa American. Speakers: James Carville, “Ragin Cajun” and Political Consultant, and Mary Matlin, author, television and radio host, widely sought after political contributor. Moderated by Evan Smith, CEO of the Texas Tribune. Speaker: T. Boone Pickens, Oilman and Philanthropist, moderated by Evan Smith, CEO of the Texas Tribune. Speakers: Harold Ford, Jr. – Chairman of the National Democratic Leadership Council, Michael Steele, Chairman of GOPAC. Speakers: Susan Eisenhower, Robert McNamara, Daniel B. Poneman, and Dr. Mitchell B. Reiss; moderated by Thomas Graham Jr.
March 4, 2004: The U.S. In The World Today: Nation Builder? World Police? Coalition Maker? March 7, 2002: American Economy Of The 21st Century: New Challenges, New Possibilities, New Futures? October 4, 2001: The American Family: A Fragile Future? October 5, 2000: Foreign Policy & The Threat Of Domestic Terrorism: Can Americans Feel Secure? February 3, 2000: Politics 2000: Virtue & Leadership? Idealism Versus Cynicism? New Hope For A New Millennium?